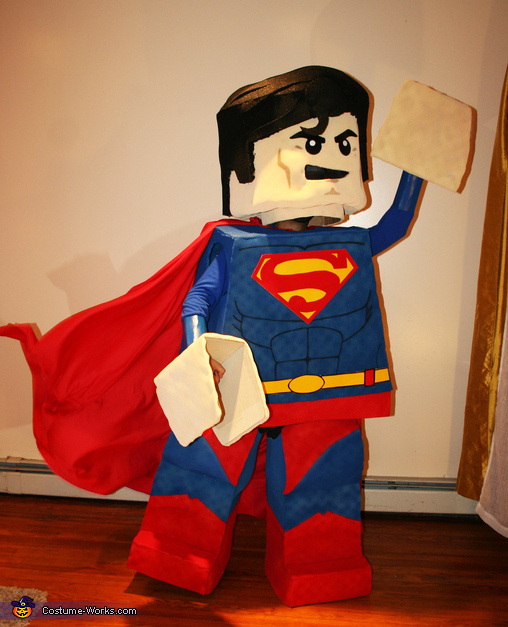 This is me in my LEGO Superman costume, 99% of which is made of foam mattress topper. Add a little bit of cardboard and poster board, a plastic construction helmet, lots of spray paint, and hot glue to put it all together (not to mention all the algebra required to scale up the measurements of a LEGO mini figure to fit my 5'6" body). In order to properly scale the proportions for the torso and leg pieces, I took measurements from my LEGO Superman mini figure and did a ton of sketches. I cut all the pieces out of foam mattress toppers, spray painted the parts using painter's tape to separate sections, and glued it all together. For the torso I used Christmas wrapping paper to create a stencil of the musculature in order to get multiple colors. The S shield was made of two pieces of poster board glued together. The headpiece is all bed foam, reinforced inside with cardboard and paper towel roll tubes, holding a plastic construction helmet in place to fit my head. The hair is also bed foam, cut out, glued together, and spray painted separately. For the facial details I found images of LEGO Superman's face online, and scaled it up using my printer to the proper size, before cutting out stencils for the details and spray painted cardboard for the eyes. Probably 50+ hours later, it was all put together with a store-bought red cape, and voila! LEGO Superman!